It's been nice, like having that one chatty dinner guest finally leave for the night. It's given me more time to read stuff I actually care about. That's been the biggest plus. The second biggest: not having to deal with silly drama. Ignorance is bliss! I am active on Medium, and enjoy the community there a lot. I have a Twitter account that I use mostly to share Medium articles. I don't have too many Twitter followers, so I am sometimes self-conscious about posting. It feels like I'm talking to myself. I use Google Hangouts a lot. I'm a fan of FaceTime. I also write letters, pen to paper. I like the feel of it. The local post office clerks know me by name, I'm there so often. When I quit Facebook I had 730-something 'friends.' Most of those folks, I'm not in touch with any longer. I think I'm more of a quality-over-quantity person though, generally. So it works out. Some people, I miss. But not most. Do it. And join Medium (an oasis). A cesspool. Or is that what it is already? 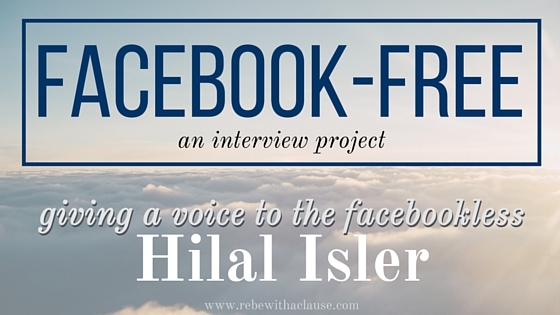 Thanks again, Hilal, for sharing your thoughts with us!